An accurate, thought provoking translation of original work from sociologist pioneer Tongo Takebe Today's sociology education emphasizes multiculturalism, yet most of the views originate from Judeo-Christian perspectives that can limit insight and understanding. 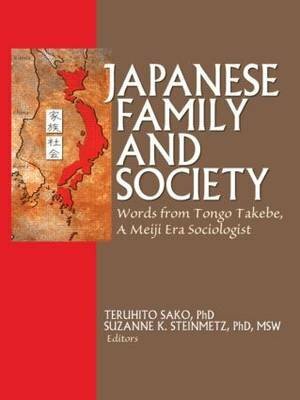 Japanese Family and Society: Words from Tongo Takebe, A Meiji Era Sociologist presents a carefully edited, accurate translation by Teruhito Sako of original work from the early Japanese sociologist Tongo Takebe. His unique viewpoint sheds light on both Eastern and Western perspectives used to describe societal development and a classification system of knowledge. This easily understandable source retains the essences of this classical Japanese social theorist's work while giving an excellent overview of Eastern and Western social theory and philosophy and discussion of major scientific advances from the earliest eras until 1900. Japanese Family and Society is a translation of Takebe's General Sociology: Introduction (1904, Volume 1) and an excerpt from General Sociology: Social Statistics (1909, Volume 3). In Volume 1, Takebe reviews the accomplishments of major Eastern and Western scholars. Systematically, Takebe discusses the major scientific advances in physics, chemistry, biology, astronomy, history, economics, philosophy, anthropology, political science, and sociology to develop criteria for a classification system of knowledge. In the excerpt from Volume 3, Takebe discusses family relationships. In these translations, Takebe focuses on the strengths and weaknesses of both Eastern and Western viewpoints of societal development in which he demonstrates the advantages of combining these perspectives. Topics in Japanese Family and Society include: a brief history of Japanese society early Japanese sociologists a biography of Tongo Takebe theoretical introduction to sociology, sociology's problems, and methodology historical introduction to the sociological ideas in Japan, China, Indian thought, Ancient Greece, Medieval Europe, and the Modern era the rise of socialism major accomplishments in various disciplines family organization, including marital relationships, parent-child relationships, sibling relationships, and others much more Japanese Family and Society can be used as a text or supplemental text for upper level undergraduate courses in social theory, sociology, philosophy, history, and social science.